It won´t help your songwriting, but the GypsyMIDI could bring your tunes to life on stage. Surprisingly simple to set up. Software is easy to use. Very sturdy frame. Good instructions. Whether or not the GypsyMIDI Motion Capture MIDI Controller (to give it its full name) turns out to be the must-have accessory for performance musicians remains to be seen, but it certainly looks the part. In fact, it conjures up images and flashbacks from sci-fi - Terminator, Buck Rogers and Tron all spring to mind. The GypsyMIDI comes with a stand, battery packs, a MIDI cable, software, DVD video instructions and, of course, the ‘suit´ itself. In reality, it´s more of a strap-on torso and arms than an all-body affair. 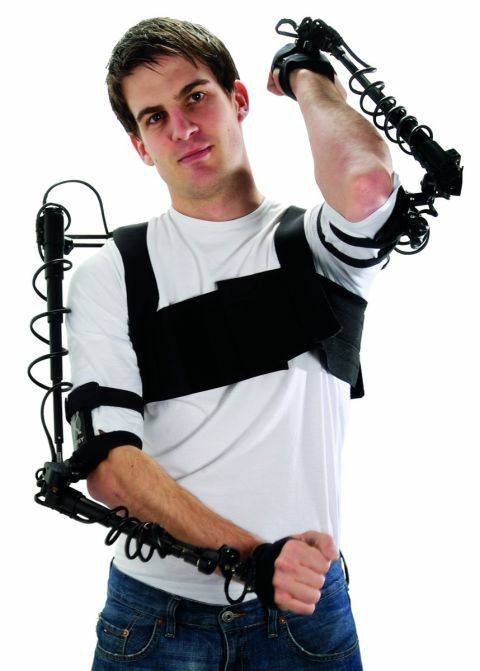 Each side has six sensors that detect shoulder, wrist, hand and elbow movements, and send MIDI information based on it. Before you put the suit on, you have to make three connections. First, you need to connect the GypsyMIDI to the MIDI In of your controller/interface, and this in turn links via USB or FireWire to your computer. Next, you need to plug in a battery pack (two are supplied, plus a charger) and put it on. The suit isn´t as ungainly as you might think, although initially, it did feel a bit snug. However, we soon realised that there are bolts to make it wider. If you don´t correctly adjust these then the GypsyMIDI could fit like some kind of torture device, but if you make the right tweaks, it´s easy to get into. What next? Well, given that the suit is the first of its kind, we expected more trouble, but things continued to run smoothly. Assuming your MIDI setup is all running properly, you should be able to get signals into your computer (these can be tested with the supplied eXo software). If you go into the Open Input Setup option, you´ll see indicators for all 12 sensors, laid out left to right. As you move, these should move with you. You calibrate the unit by twisting your wrists, arms, elbow and shoulders to their maximum ranges so that the software knows your ‘full spread´. Once you´ve calibrated the suit, you can start to select which sensors control which MIDI parameters. Again, this is done within the eXo software. Setups for Ableton Live and NI Traktor come included, and a selection of presets help you to carry out certain tasks. Getting GypsyMIDI to work with Live proved simple, and we were soon triggering notes and loops. Once you understand the eXo software you can get the suit to perform all manner of tricks. These range from simple triggering to more complex crossfades and MIDI controller exercises that enable you to mess with the makeup of a sound by sweeping your arms. It´s at this stage that you become less a composer and more a performance artist - this is one for the exhibitionist rather than the stay-at-home bedroom producer. Which leads us to the conclusion. The GypsyMIDI is less a tool to help you come up with new musical ideas and far more a performance controller. If you just want to compose and play in the traditional manner, stick to your keyboard. At over a grand, the suit isn´t the kind of thing you´d invest in on the off-chance that you might occasionally experiment with it, either. If performing and messing with your sequences in a live arena is your bag, however, this suit´s ideal for you. Strap yourself in and get out there.